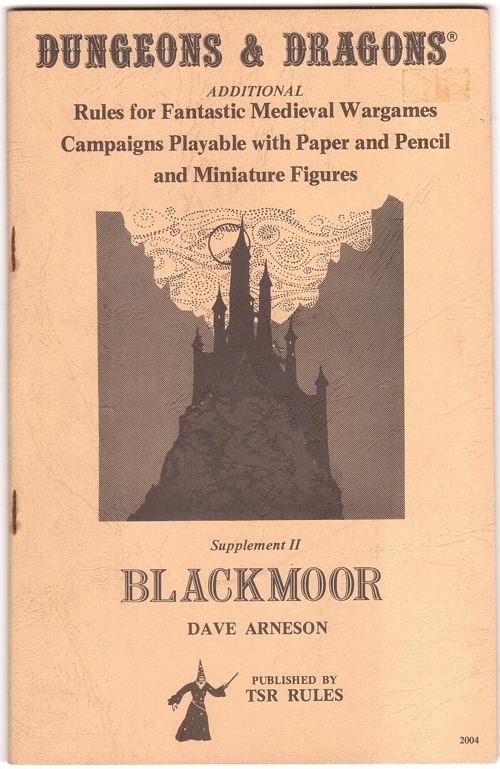 This is the last of the original D&D supplements I needed to complete my collection: Blackmoor. I bought it at the same time as the other two, Eldritch Wizardry and Gods, Demi-Gods and Heroes, but it only arrived today. That's because I ordered it from the USA, which takes a while longer to get here. Of course, it would have got here sooner if Her Majesty's Customs and Excise hadn't held it in their warehouse for several days waiting for me to pay £6.25 of VAT on it (plus the £8 charged by the Post Office for processing the payment). I don't really see why the person buying the goods has to pay what's effectively a sales tax; that's the job of the seller, surely? Also, this is a booklet and is entirely printed matter, which is famously exempt from VAT in the UK. I wouldn't care, but out of all the D&D supplements, Blackmoor was the one we didn't actually like. Half of it is someone else's campaign, with maps and things. We liked making our own campaigns. From our perspective, the whole point of D&D was the creativity. Why would people want to buy someone else's creativity instead of being creative themselves? We just didn't get it. I still don't, to be honest.